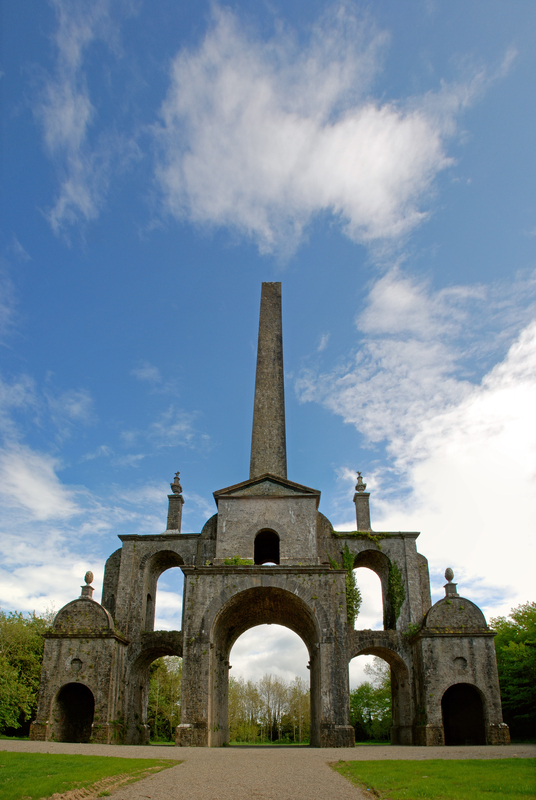 In August 1736 the Dublin Gazette reported, ‘On Friday last two curious fine monuments, lately finished by Mr Carter near Hyde Park Corner, were put on board a ship in the river in order to be carried to Ireland, to be erected in the church of Castletown near Dublin, to the memory of the Rt. Hon. William Conolly Esq., Late Speaker to the House of Commons, and his lady.’ The two life-sized figures of William and Katherine Conolly were commissioned by the latter after her husband’s death in 1729 from London-sculptor Thomas Carter (although it has been proposed that Mrs Conolly’s likeness may be from the hand of his son, Thomas Carter Junior). Originally they formed part of a larger monument in a mausoleum attached to the church in nearby Celbridge but in recent decades this fell into disrepair and in 1993 the figures were removed to Castletown where they can be found facing each other in a ground floor passage behind the main staircase. During this post-festive season, when evenings can seem especially long and monotonous, readers might like to consider occupying their time with the creation of a print room. This once-fashionable pursuit, which had its heyday in the second half of the 18th century, subsequently fell out of favour and only one intact example survives in Ireland: that at Castletown, County Kildare. The design and execution of print rooms was customarily left to women, although it evolved from the mostly-male habit of collecting valuable prints and storing these either in a cabinet or within albums. Later on prints might be hung in a chamber designated for the purpose, often kept shrouded in order the work avoided suffering light damage: while cheaper than paintings prints, especially those of larger dimensions could be expensive to produce. However, larger runs of prints in the 18th century, often reproductions of popular works of art, helped to bring down costs and make these pictures accessible to a broader market than had hitherto been the case. Cheaper prices led to greater disposability and the emergence of the print room, a phenomenon effectively unique to Britain and Ireland (although there were some instances of the vogue found in America). Located behind the house’s main staircase and part of an enfilade on the ground floor overlooking the garden, Castletown’s Print Room was created in 1768 by Lady Louisa Conolly. 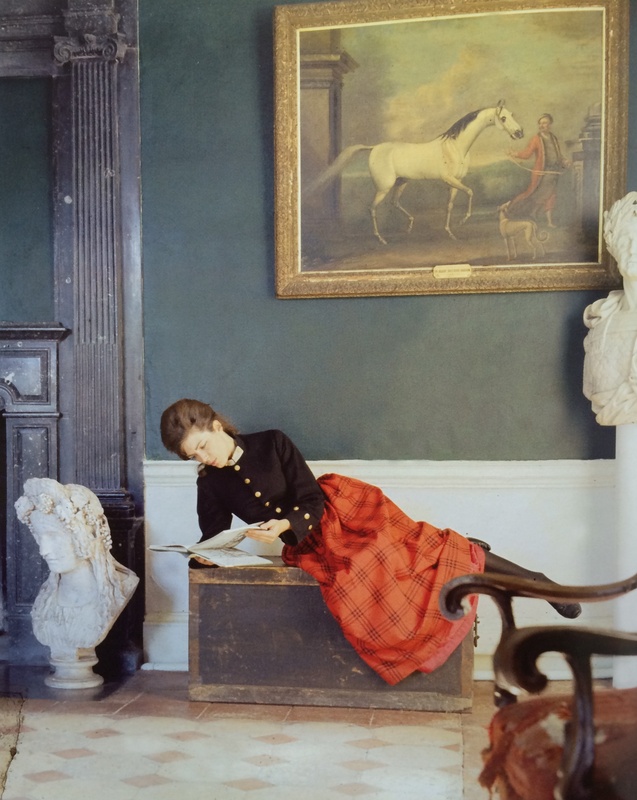 She had been collecting pictures for at least the previous six years, and in addition had gained experience through assisting in similar ventures with her sister Emily, Countess of Kildare at nearby Carton and with Lady Clanbrassil at Cypress Grove House, Templeogue, County Dublin. Both these rooms have since been lost. The project was a long time in gestation: in 1762 she wrote to her sister Lady Sarah Bunbury, ‘I always forget to thank you my Dear for the Prints you sent me, I hope you got them of Mrs Regnier, for I have a bill there, the two little ones that you admired so, are the very things I wanted, that of Helen is charming. I have not had time to do my Print room yet.’ It is likely the reason the Print Room took so many years coming into existence is both because the Conollys were preoccupied with other work at Castletown and because Lady Louisa did not want to rush preparing the layout of what is a larger space than that customarily used for such a purpose: the ceiling here, for example, is twenty-five feet high. As a result, an awful lot of prints were needed. As late as February 1768 she was still writing to her sister Lady Sarah, ‘…any time that you choose to go into a print Shop, I should be obliged to you, if you would buy me five or Six large Prints, there are some of Teniers engraved by LeBas, which I am told are larger than the common size, if you meet with any, pray send me a few.’ Working out the design for this room was a complex business, particularly since border frames for each of the frames also had to be prepared, as well as garlands, trophies and other elements of the overall decoration. 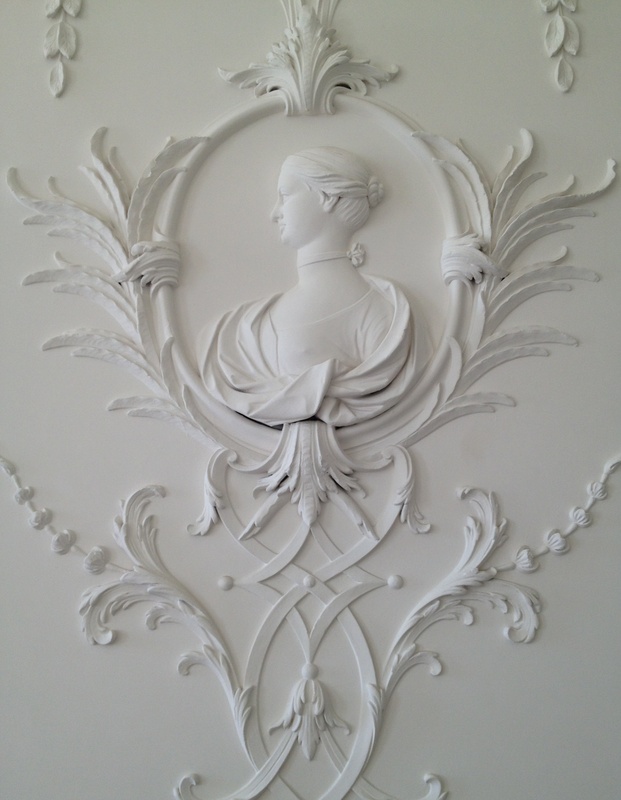 When Lady Louisa finally came to embark on the scheme, the prints were duly cut out and then glued onto lengths of warm off-white painted paper. These in turn were attached to the room’s walls on battens overlaid with cloth. As Ruth Johnstone has noted, in many cases Lady Louisa ‘made editorial decisions based on the outside shapes of images.’ Accordingly she altered the original rectangular format of forty-six images to either an octagonal, oval or circular shape, or to a rectangle with a convex top. Most likely because of the need to create a visual balance based on size and shape there is no overriding theme to the pictures but rather they reflect mid-18th century taste. A handful of images were included for a specific reason. 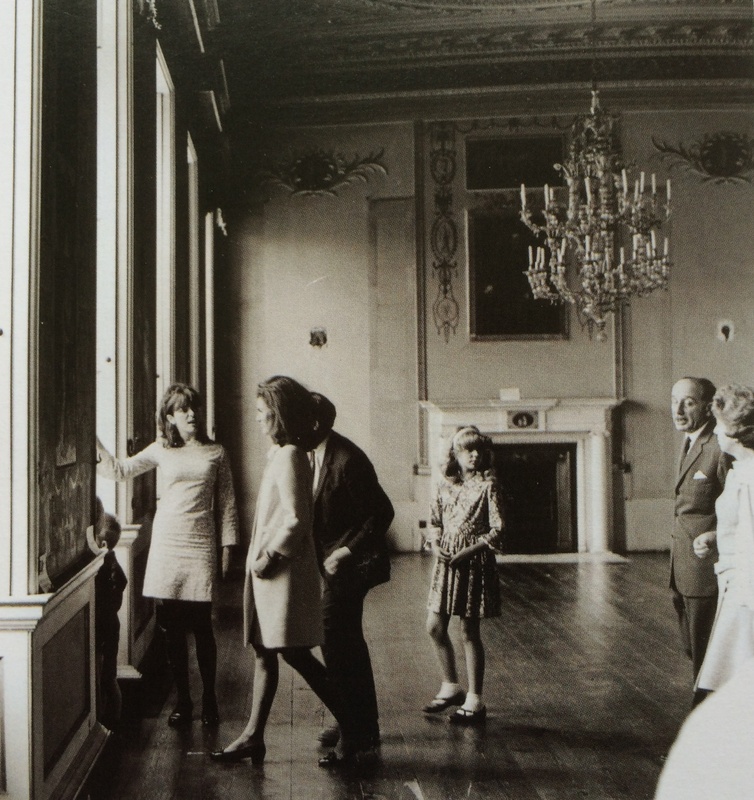 In central position between the two windows, for example, is a print of Van Dyck’s portrait of the children of Charles I, a group including Lady Louisa’s great-grandfather Charles II. 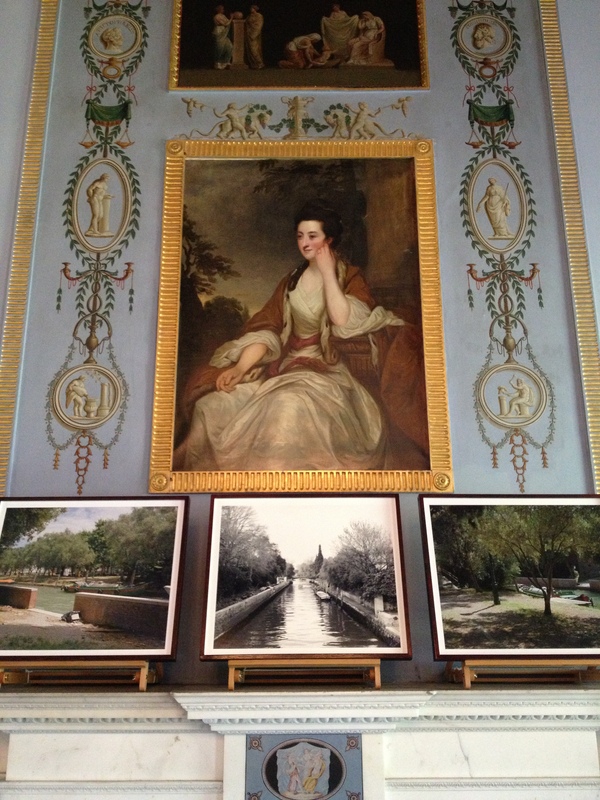 In the same position on the opposite wall is a print taken from Sir Joshua Reynolds’ portrait of Lady Louisa’s sister, the aforementioned Lady Sarah Bunbury (the original painting, incidentally, is now in the collection of Chicago’s Art Institute). 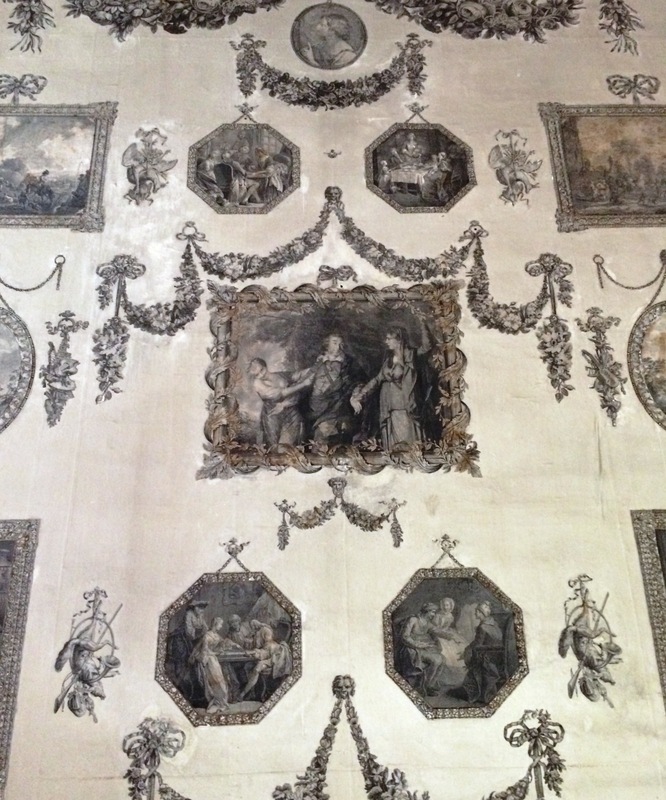 Providing a centrepiece on the east and west walls are prints of the era’s most famous actor, David Garrick, and the room also includes a portrait of William Pitt, Earl of Chatham, rather surprising since he was a political opponent of Lady Louisa’s brother-in-law Henry Fox, first Baron Holland. Otherwise the sources were diverse, with a fondness for both pastoral and classical subjects taken from the works of diverse artists including Teniers, Greuze, Jan Steen and Claude Lorrain. Despite such dissimilitude, Castletown’s Print Room conveys an impression of homogeneity thanks to its designer’s careful preparation. Anyone intending to embark on a similar enterprise will find these long winter evenings perfect for similarly thorough planning. Much more information on Castletown’s Print Room can be found in Ruth Johnstone’s essay on the subject including in the Office of Public Work’s 2011 publication Castletown: Decorative Arts. This week marks the 25th anniversary of the death on May 8th 1989 of Mariga Guinness at the age of only 56. It seems an opportune moment to celebrate her life, especially since an entire generation has since grown up without having had the opportunity to meet Mariga and to benefit in person from her influence. For those unfamiliar with her story, Marie-Gabrielle von Urach was born in September 1932, the only child of Prince Albrecht von Urach and Rosemary Blackadder. Her mother’s family were from the Scottish borders, her father’s a junior branch of the royal house of Württemberg in southern Germany; her grandfather was briefly King of Lithuania, a great-aunt Queen of Belgium and a great-grandaunt the Empress Elizabeth of Austria. 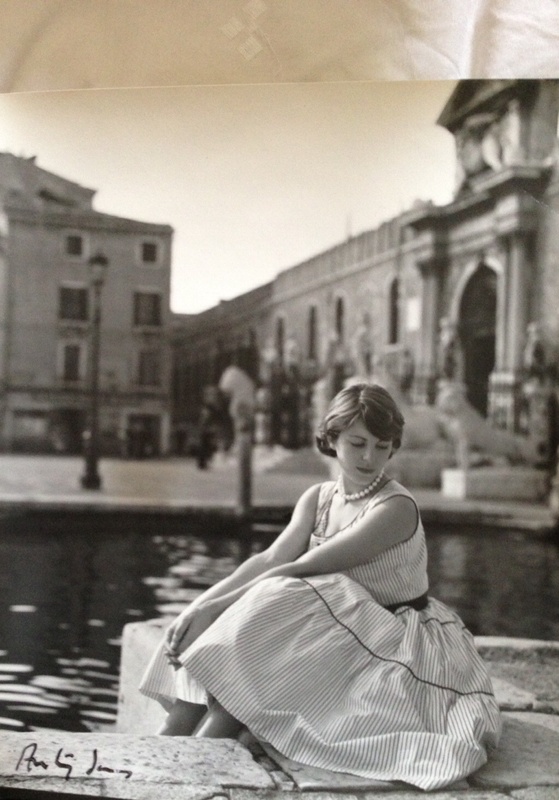 Although her father had been expected to succeed to the principality of Monaco (an extraordinary story in itself), in the aftermath of the First World War this arrangement was abandoned and so he came of age with little money and no prospects. Both Mariga’s parents were artists and in the mid-1930s they and their daughter moved to Japan where Prince Albrecht was attached to the German embassy as a government photographer. However in 1937 Rosemary von Urach decided the Japanese Emperor was being misled into aggression by his generals, and taking Mariga with her somehow gained admission into the imperial palace to offer him advice. Arrested and sedated by security guards, she was sent back to Britain where she had a breakdown followed by a lobotomy and spent the rest of her life in a Scottish mental hospital. Meanwhile Mariga’s father continued working for the German government throughout the Second World War and did not see his daughter again until she was sixteen and he had remarried (when they reunited he did not tell her this himself and she only found out indirectly). In the intervening years Mariga had been raised in England by a septuagenarian unmarried friend of her grandmother’s who died in 1951, leaving her charge possessed of little other than great intelligence and beauty. That same year she was introduced to the Hon Desmond Guinness by her cousin Prince Rupert Löwenstein. The couple married in June 1954 and moved to Ireland the following year. 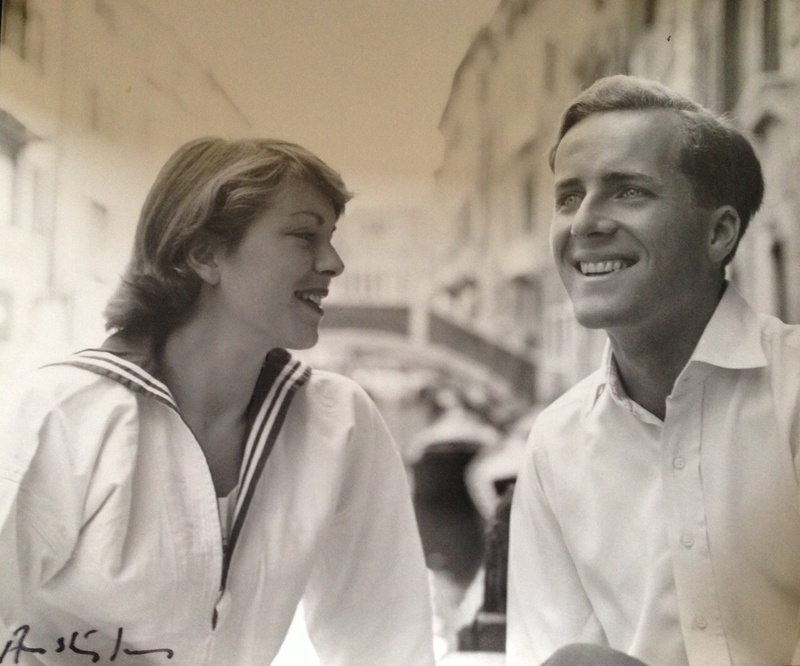 Desmond and Mariga on their honeymoon photographed by Anthony Armstrong-Jones (later Earl of Snowdon); these pictures courtesy, and property, of their son Patrick Guinness. Mariga first visited Ireland (at the invitation of the late Mark Bence-Jones) in 1953. He later remembered that she arrived in a ball dress having gone straight from a dance in London to catch an early flight. ‘The first thing they asked me when I got off the ‘plane was “Have you been on a farm?”’ she said with her unerring sense of the incongruous (there had recently been an outbreak of foot and mouth disease in England). Afterwards she wrote, ‘Ireland is HEAVEN, everyone is so dotty and delicious and no one dreams of taking anything seriously; except, perhaps the Horse Show.’ Of course, after moving here Mariga took the country very seriously, not least in her ceaseless campaigns to preserve its architectural heritage and her founding with Desmond of the Irish Georgian Society in 1958. The society was run from the couple’s home at Leixlip Castle, County Kildare which they had bought and restored after looking at countless other houses around Ireland. Leixlip represented Mariga’s highly distinctive and influential taste. As architectural historian Mark Girouard has written, ‘In the 1960s Mariga Guinness made Leixlip Castle an unforgettable place: a solid, four-towered mediaeval castle converted in the early 18th century with huge, thick-barred windows and spacious, simple rooms looking down to the Liffey; a massive front door that was never locked; and inside an inspired assembly of mainly Irish 18th-century furniture and pictures, put together and set off with a sense of color and occasion, a mixture of informality and showmanship, to make a setting in which it seemed that anything could happen and anyone might turn up. One would turn up oneself, pull open the front door and wander into empty rooms with log fires smoldering, until people would, perhaps, begin to appear: millionaires, Irish professors, Anglo-Irish lordlings, pop stars, German princes, architects, priests, art historians, students, all revolving around Mariga, with her drawling voice and mischievous smile, and Desmond, with his charm and blazing blue eyes. Although we met in passing on a couple of occasions when I was still a student, it was only after she had divorced and I had graduated that Mariga and I came to know each other. By then she had perforce moved out of Leixlip Castle and was living in Tullynisk, the dower house of Birr, County Offaly. It was definitely a house of contrasts, on the one hand a grim little kitchen (out of which surprisingly delicious meals were produced) and on the other the main rooms which were decorated with Mariga’s customary flair and discernment. Despite chaos forever appearing imminent, life at Tullynisk was actually rather well-ordered: overnight guests found their rooms perfectly prepared, logs neatly piled beside the grate (the house was always cold), fresh linen on the beds, and carefully chosen reading matter on an adjacent stand. No matter how late we had all scattered – and it was often very late – the followed morning Mariga would be the first to rise, moving about the house with trays laden for the breakfast table. 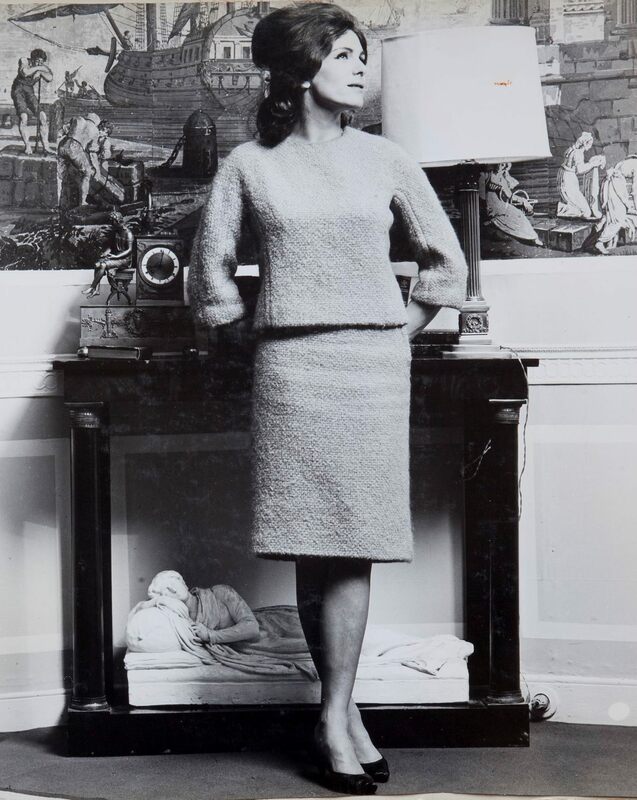 At the same time, disorder reigned behind the scenes: Mariga’s unparalleled collection of historical costume, for example, remained heaped in a tempting Everest on one bedroom floor, periodically raided for dressing-up on her instruction during parties. And her wonderful library, although the majority of books were eventually shelved, never had any real order put on it. Meanwhile she continued to drive a battered old Citroen, which periodically refused to move and would sometimes spend months outside the house. I remember Mariga’s bafflement when she was summoned to appear in court in Birr for failing to tax the vehicle, her logic being that since it was immobile no taxation ought to be required. The truth was that during those final years Mariga was deeply unhappy, the melancholia to which I suspect she had always been vulnerable threatening to overwhelm her. 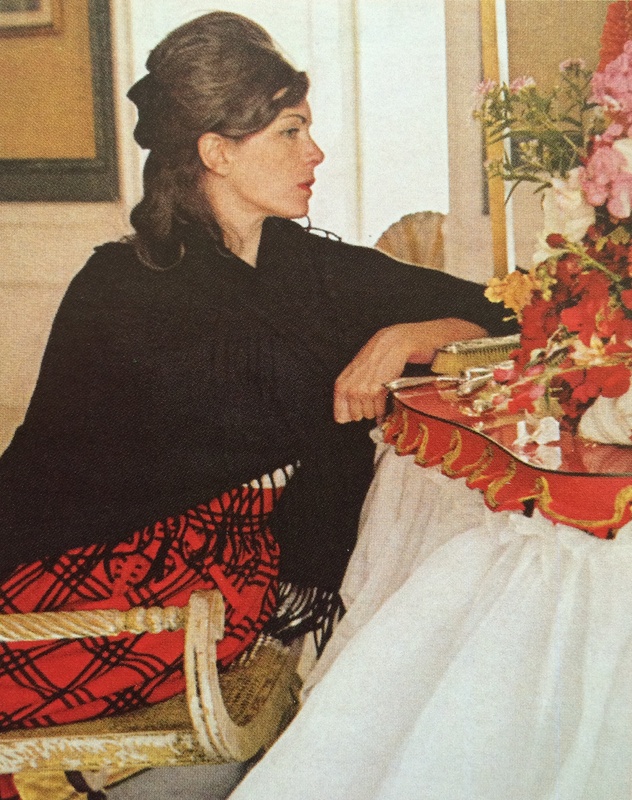 Although she tried to keep herself busy and organised regular house parties and outings – a caravan of cars driving slowly down pot-holed laneways in pursuit of an alleged architectural gem that more often turned out to be an undistinguished farmhouse, its owners baffled by the spectacle of this troupe of eccentric gawkers – she was often alone. 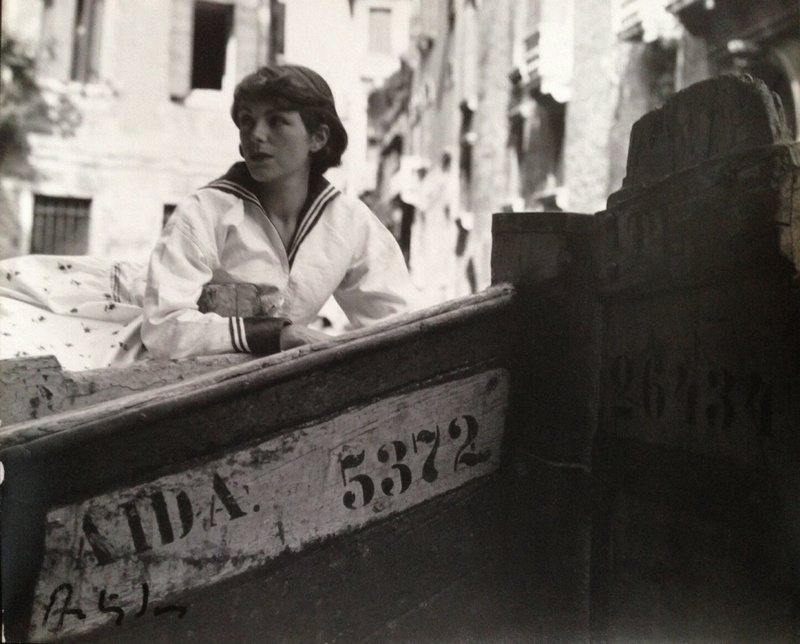 At such times she must have felt the world of which she had once been so vital a part had moved on and forgotten her. Of course it hadn’t, and more importantly it still hasn’t. All of us remained heavily indebted to Mariga Guinness and her inspirational leadership. Through her dynamism and commitment, Ireland’s architectural heritage became better known and appreciated, and preserved, than would otherwise have been the case. This week’s anniversary of her untimely death allows us an opportunity once more to pay due acknowledgement to a remarkable woman. When Thomas Conolly married Lady Louisa Lennox in 1758, Castletown, County Kildare which had been built by his great-uncle William from c.1722 onwards still lacked a main staircase. 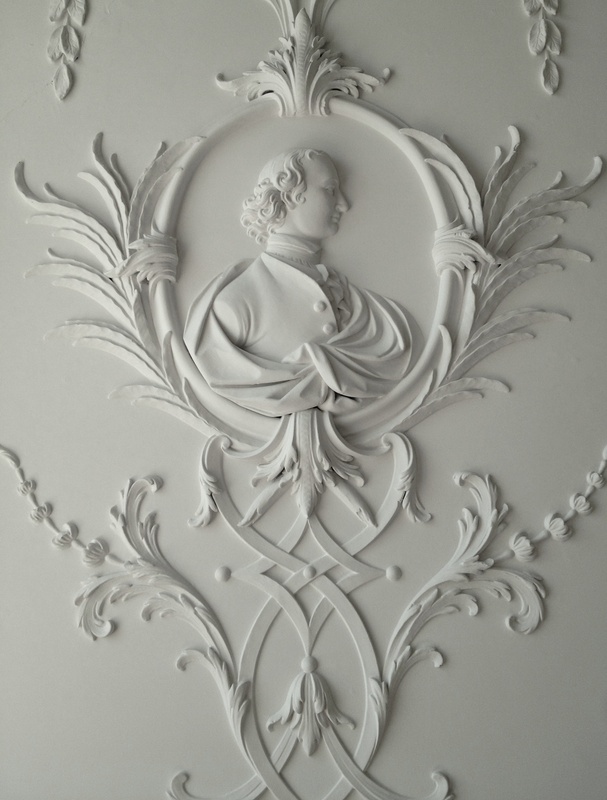 The young couple undertook to address this want and within a year of their wedding seem to have employed the Swiss-born stuccadore Filippo Lafranchini to work on the plasterwork decoration. 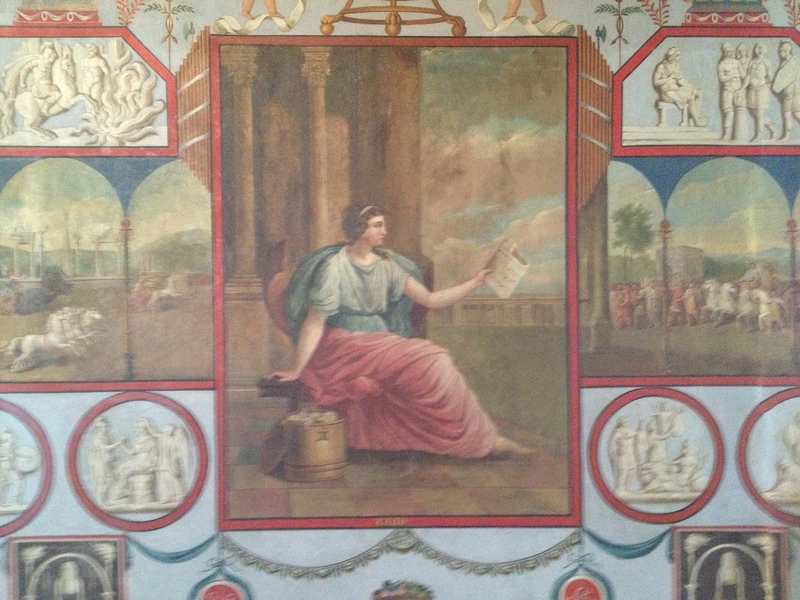 The result, as Joseph McDonnell has written, ‘evokes, like little else in the country, the spirit and grandeur of the grotesque decoration of Imperial Roman interiors…’ Yet in the midst of the grandeur one also finds domesticity, not least in the profile portraits inserted by Franchini into the stairhall walls and believed to represent members of the Conolly and Lennox families. This is especially true when one reaches the landing and encounters a pair of heads facing each other across a now-empty stucco frame. These are depictions of Tom and Louisa who together did so much to enhance the beauty of Castletown. As is widely known, in August 79 A.D. Mount Vesuvius in southern Italy erupted, sending a plume of ashes, pumice and other rocks, and scorching-hot volcanic gases so high into the sky that people could see it hundreds of miles away. ‘I believed I was perishing with the world, and the world with me,’ afterwards wrote Pliny the Younger, who saw the eruption from the other side of the Bay of Naples and whose uncle Pliny the Elder, an admiral of the Roman fleet, died in the catastrophe. Many residents of the nearby town of Pompeii quickly fled but those who remained behind soon found it impossible to do so: falling ash clogged the air and made breathing difficult, buildings started to collapse and then a 100-miles-per-hour torrent of hot poisonous gas and pulverized rock – called a pyroclastic surge – poured down the mountain and covered everything and everyone in its path. Buried beneath at least thirteen feet of volcanic ash, Pompeii was forgotten until 1599 when the digging of an underground channel exposed a few walls. However, the site was covered up and not explored again until the mid-18th century. First in 1738 came the excavation of the former town of Herculaneum, which had also been destroyed in the eruption of Vesuvius and which was found by workmen digging the foundations for a summer palace for the King of Naples. A decade later work on Pompeii was intentionally initiated. The excavations at Pompeii and Herculaneum excited widespread interest, and were much visited by affluent Irish and English travelers in Italy participating in the Grand Tour. Furthermore books were published with engravings of what had been uncovered on these sites, in particular the elaborate painted decorative schemes that covered the walls of ancient Roman houses. 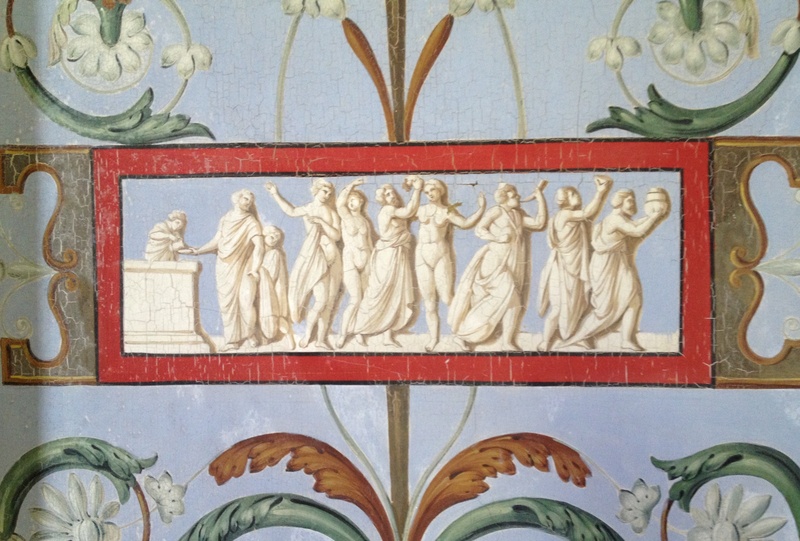 Some of these ideas had been emulated in the 16th century thanks to the discovery around 1500 of sections of Nero’s Domus Aurea in Rome, the inspiration in that city for work by Raphael and his successors in the Vatican loggie and the Villa Madama, and in turn for French artists of the Fontainebleau school. The style took longer to win adherents in England and Ireland, but began to attract interest with the appearance from 1757 onwards of successive volumes of the official Le Antichità di Ercolano which contained engravings of wall paintings. A stir was caused by the creation c.1759 of the Painted Room in Spencer House, London designed by that great advocate of neo-classicism, James ‘Athenian’ Stuart. 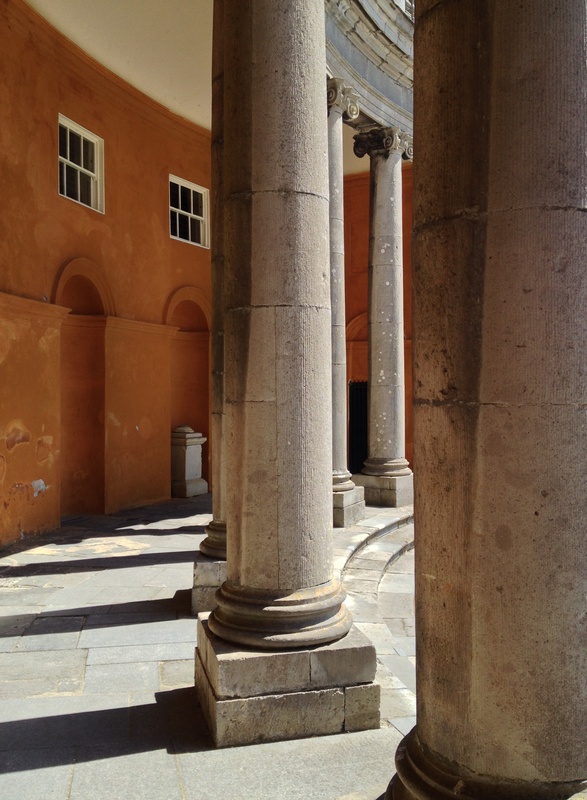 The Adam brothers then undertook similar decorative schemes in such houses as Syon on the outskirts of London and Kedleston Hall in Derbyshire, and later Osterley Park, London. 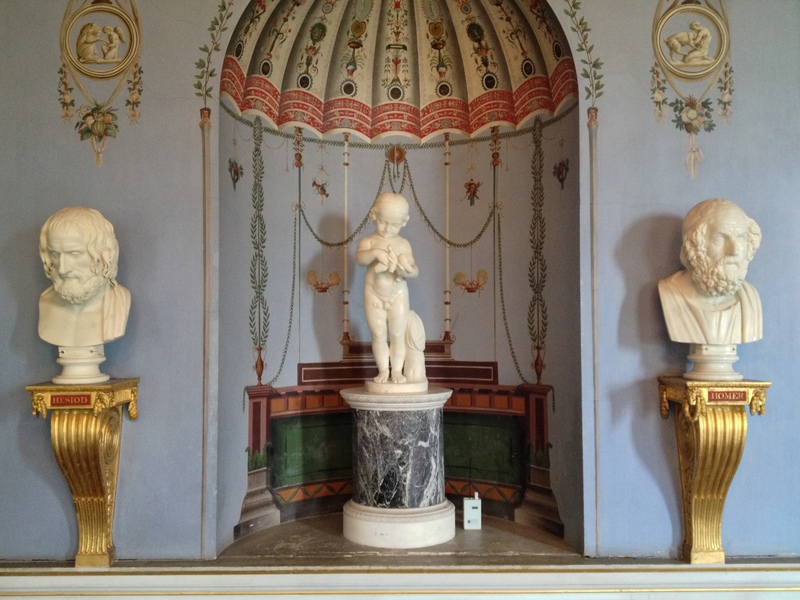 In the 1770s the interiors of Fawley Court, Buckinghamshire were designed in pure ‘Etruscan’ style by James Wyatt, an early commission which helped to establish his reputation. 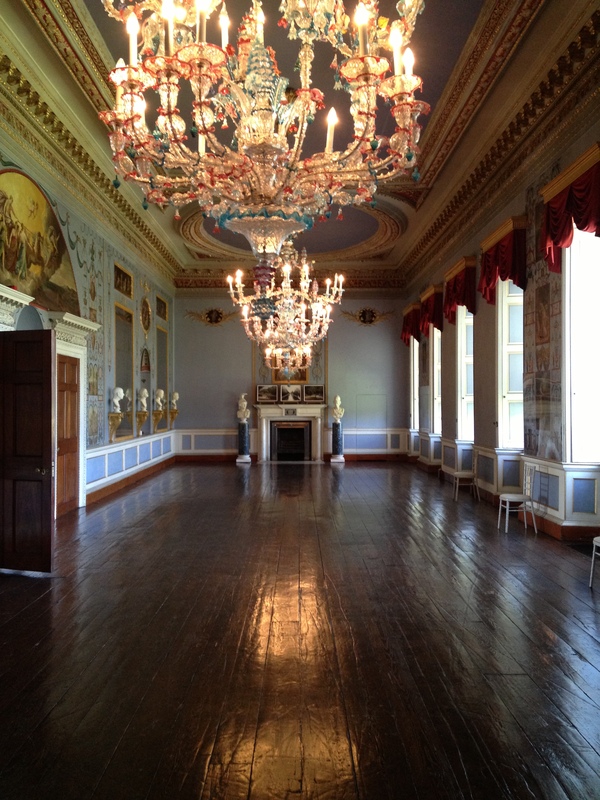 Only one room painted in the Pompeian style exists in Ireland: the Long Gallery in Castletown, County Kildare. The house was built in the 1720s and initially this space was used as a picture gallery but this looked old-fashioned even by the time Thomas Conolly took up residence at Castletown in 1759. When in Rome the previous year he had his portrait painted by Anton Raphael Mengs (a copy of the picture can be seen over the chimneypiece at the east end of the room) and may have visited Herculaneum and Pompeii. Incidentally also in 1758 Mengs painted an imitation ancient Roman fresco representing Jupiter and Ganymede in Rome’s Palazzo Barberini in order to mislead art historian Johann Joachim Winckelmann; so convincing was this work that Winckelmann was duped into believing it was an original. 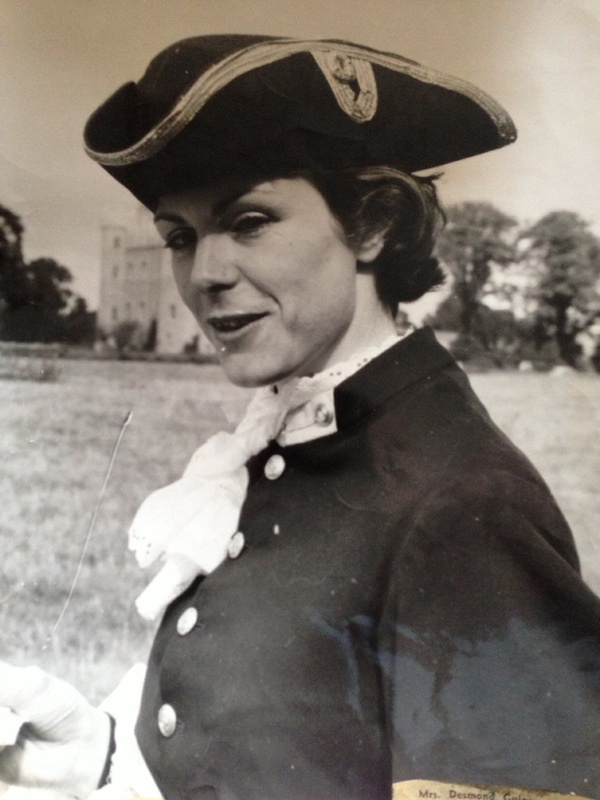 On his return from Italy Thomas Conolly married the 15-year old Lady Louisa Lennox, one of the four daughters of the second Duke of Richmond whose story was told in Stella Tillyard’s 1995 book Aristocrats. 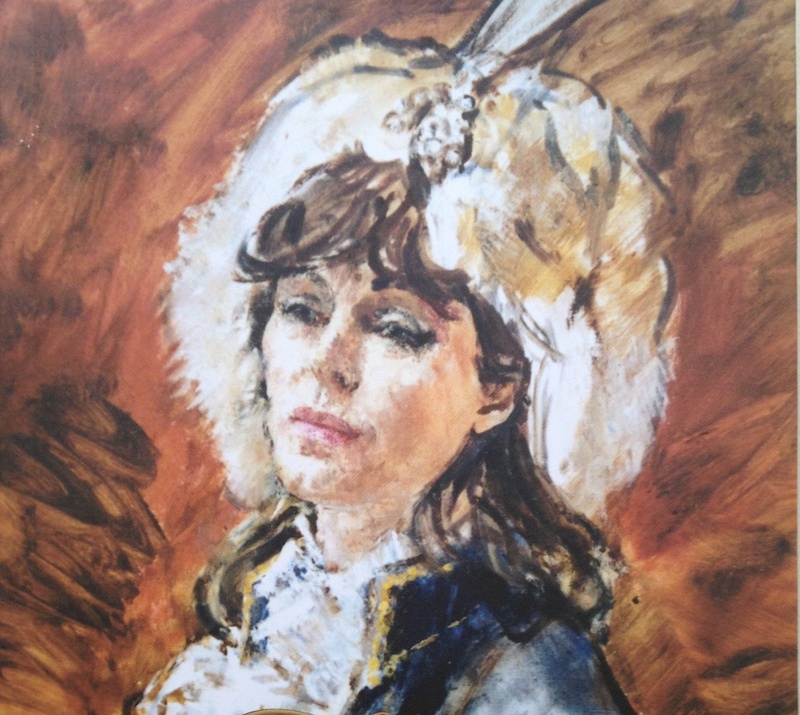 Lady Louisa’s older sister was married to James FitzGerald, Earl of Kildare (and later first Duke of Leinster) who lived less than four miles away at Carton House. Over the next twenty years or so the Conollys carried out extensive alterations at Castletown, not least to the Long Gallery. Situated on the first floor and with eight windows looking north (towards the Conolly Folly of 1740), the room measures 79 feet three inches by 22 feet nine inches. 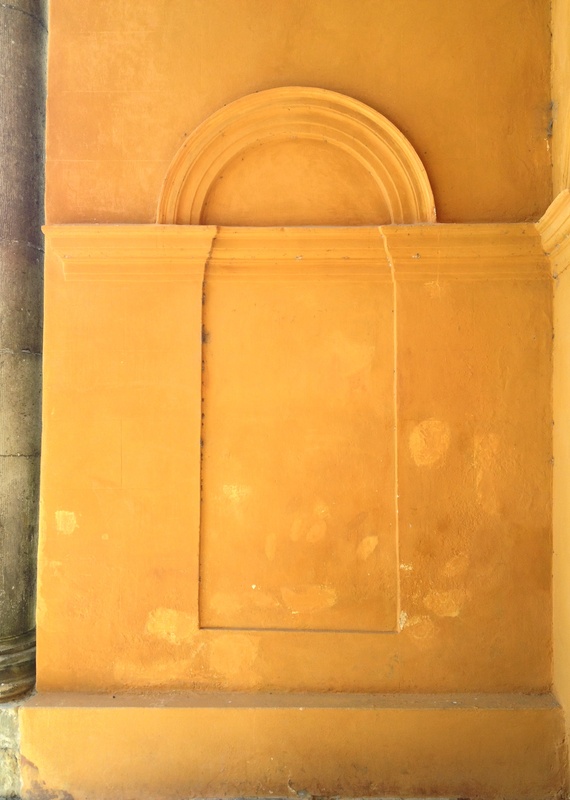 Originally there were four doors but as part of Lady Louisa’s decorative scheme, this was changed and there is now only one entrance (the matching door on the south wall is blind). 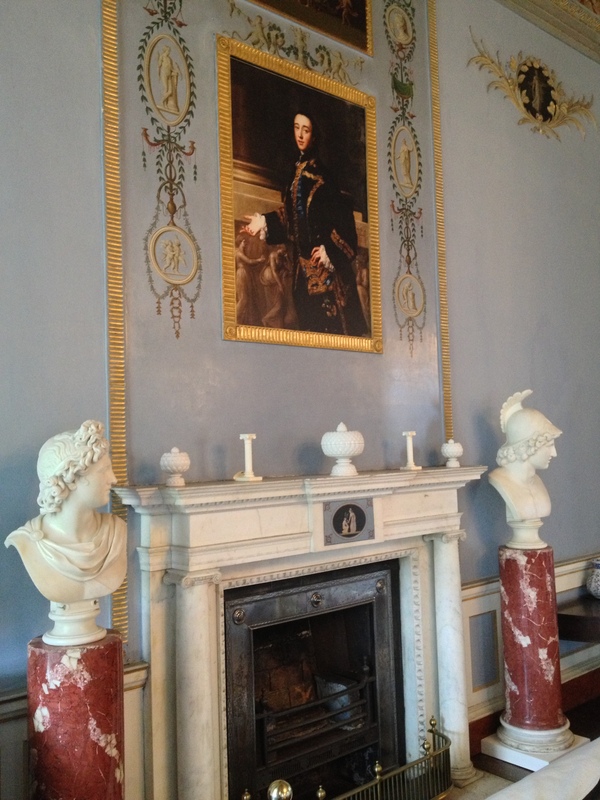 There are white marble chimneypieces at either end, that already mentioned and its pair above which is a copy of Lady Louisa’s portrait by Sir Joshua Reynolds. The doors and chimneypieces were designed by Sir William Chambers, the actual work believed to have been overseen by Simon Vierpyl who performed a similar role at the casino in Marino (see Casino Royale, March 25th). 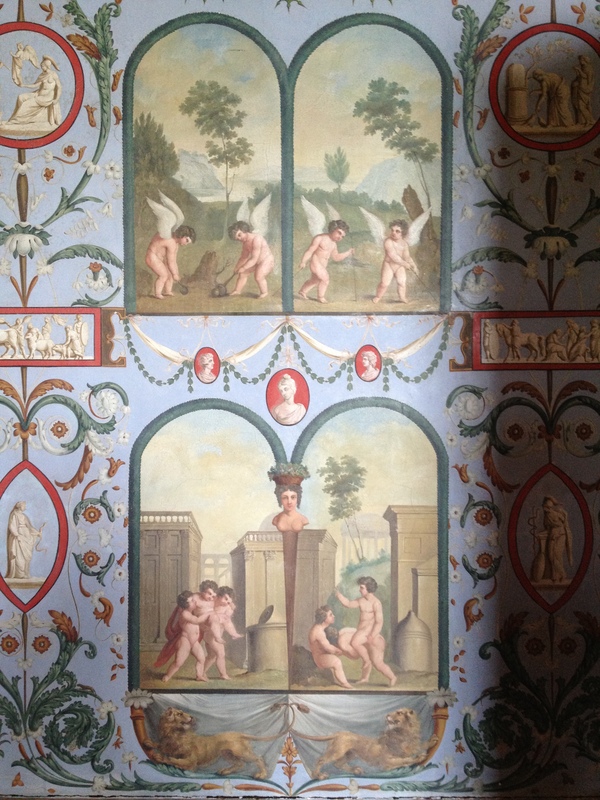 The Long Gallery’s Pompeian-style decoration dates from 1775/76 and was undertaken by English artist and engraver Charles Ruben Riley (frequently referred to in Lady Louisa’s correspondence as ‘little Riley’), assisted by Thomas Ryder. It was a slow process with many changes for in August 1776 Lady Louisa wrote to another of her sisters, ‘Mr Riely [sic] goes on swimmingly in the Gallery but I am doing much more than I intended, that pretty white, grey and gold look that I admired in the ends of the room, did look a little naked by the painted compartment when finished and upon asking Mr Conolly’s opinion about it, he meekly told me, he always thought it would be much prettier to have painting, but thought I knew best.’ Clearly Mr Conolly understood the merits of a quiet marital life. 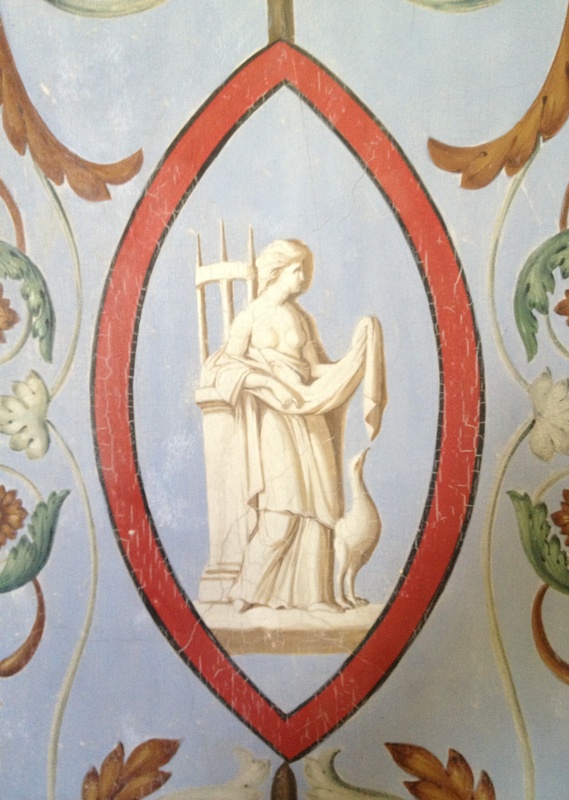 Seen yesterday, a detail of the stair hall at Castletown, County Kildare. 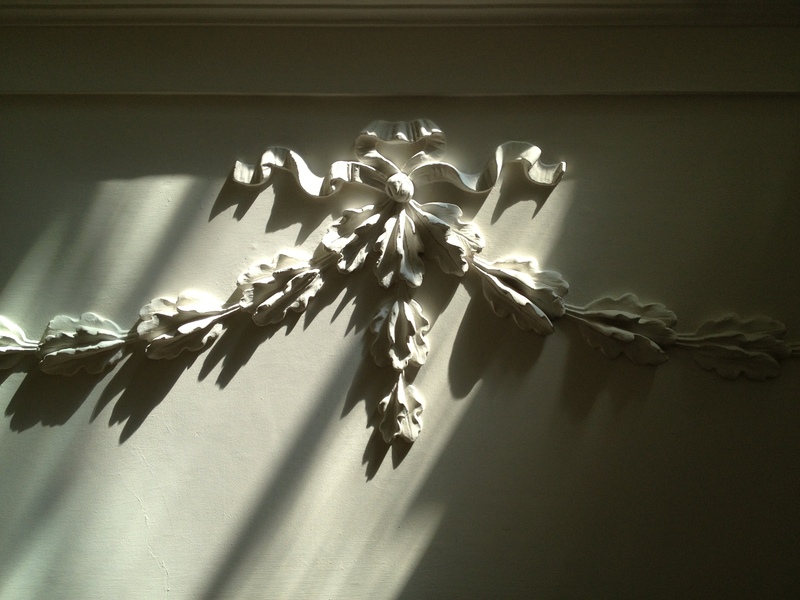 Commissioned by Thomas and Lady Louisa Conolly this graceful plasterwork dates from the mid-1760s and is the work of the Swiss-born stuccodore Philip Lafranchini. More about Castletown before too long.